1995년 전남 구례군 마산면 황전리에 소재하고 있는 화엄사 경내 서오층석탑(보물 제133호)의 해체보수작업을 하던 중 탑 내부에서 발견된 통일신라시대의 일괄 유물이다. 백지묵서다라니경, 청동불상범 외에 청동방울과 장식, 철제칼, 금속편, 수정 등 다양한 유물이 발견되었다. 이들 유물 중 백지묵서다라니경은 다라니경의 내용을 필사한 것으로, 고려시대 이전의 서적이나 기록이 거의 전해지지 않는 상황에서 통일신라기의 종이·글자체·문자 등 서지학적 혹은 불교에 대한 중요한 정보를 제공해 주는 귀중한 자료이다. 탑인은 한국 고대인쇄사에 있어서 초기단계를 알게 해주는 국내 유일의 실물자료이다. 청동불상범은 우리나라에서는 거의 유일한 불상주조용 틀로서 불상의 대량생산을 알려 주는 중요한 유물이다. 화엄사 서오층석탑 발견유물은 통일신라시대 불교사상과 교리,사회적 배경을 종합적으로 재조명할 수 있는 유물들로 서지학, 미술사 등 학술연구에 귀중한 자료로 평가된다. Containing many objects dating back to the Unified Silla Period (676 - 935) like the Pure Light Dharani Sutra written in Indian ink on a sheet of paper, mold for production of bronze Buddha images, bronze bells and accessories, iron knife, iron pieces, and crystal pieces, this reliquary was found from the Five-tiered Stone Pagoda (Treasure No. 133) in the west section of Hwaeomsa Temple in Hwangjeon-ri, Masan-myeon, Gurye-gun, Jeonnam in 1995 when it was dismantled for repairs. The aforesaid Pure Light Dharani Sutra is a precious material that tells us about the paper, calligraphic letter style, and letters used during the Unified Silla Period since it is hard to find records or books dating back to a period preceding the Goryeo Period (918-1392). Tabin is the only available material showing what the initial stage of the country’s history of printing was like. 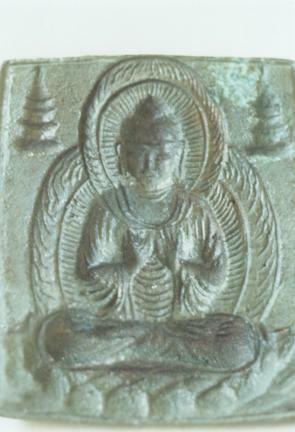 Said mold is a very rare one, indicating the production of Buddha images in large quantities. Said relics are precious materials for those studying bibliography and fine art history.